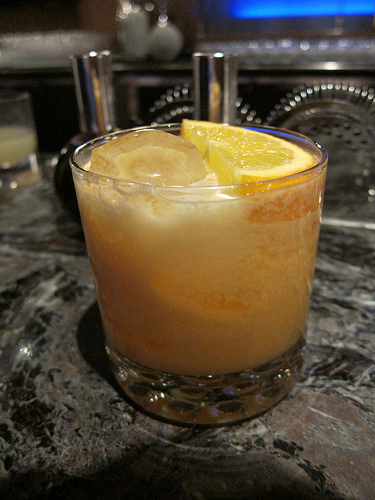 For Social Mixology’s Repeal Day party at the Cathouse (Luxor Hotel) in Las Vegas, Kate Grutman from Sotto, came up with “I’m on a boat” (Sailor Jerry’s, pineapple, lime, unsweetened Thai coconut milk, Orange Crush soda, Angostura Bitters spray). 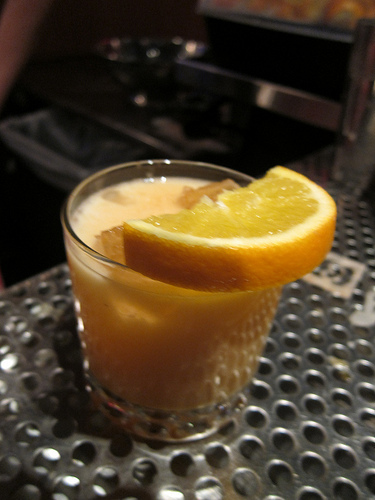 I had the opportunity to see how this cocktail evolved from specs to the actual drink that was given to guests. The drink was originally planned for a rocks glass but Kate wanted to see how it’d work in a coupe. 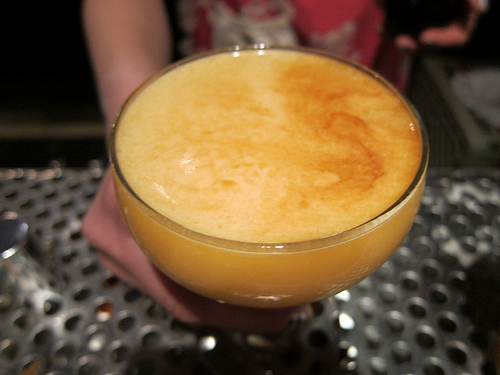 The idea was to mist the Angostura over the tiki stencils to create a pattern over the drink. It didn’t leave much of an impression. If only this cocktail had an eggwhite foam. 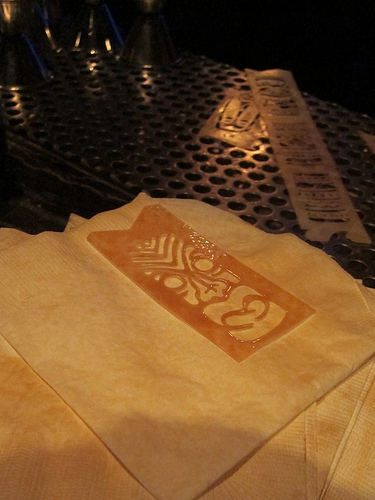 A sour drink would showcase the tiki stencil superbly. 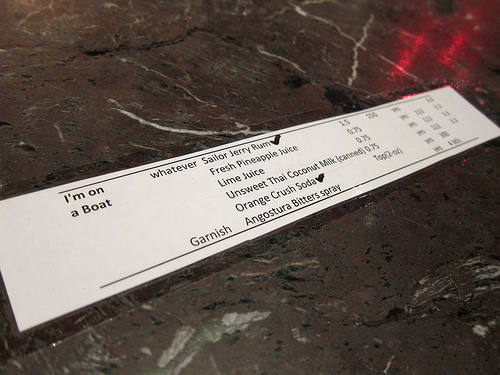 But this now meant there was no garnish. Should we use an orange slice? Kate and I left for a quick meal and the barbacks quickly chopped up orange slices to go with her cocktail. After dinner, Kate was inspired to add simple syrup to the mix. She felt the fresh pineapple juice wasn’t quite sweet enough. I really thought it added to the mouthfeel of the cocktail. Voila, it’s now perfect. But what to do with the stencils? She was inspired to spray the designs onto beverage napkins. Brilliant! final product- I'm on a Boat! 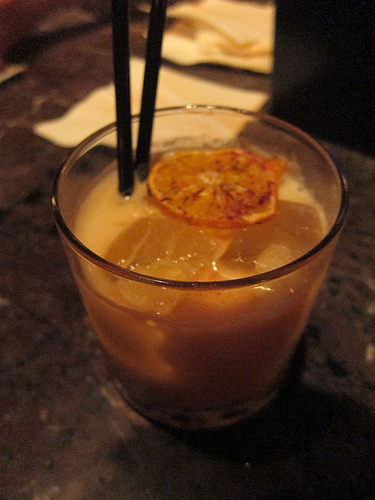 Sometime later in the night, I happened to catch the drink was now garnished with dehydrated orange wheels. Very nice. 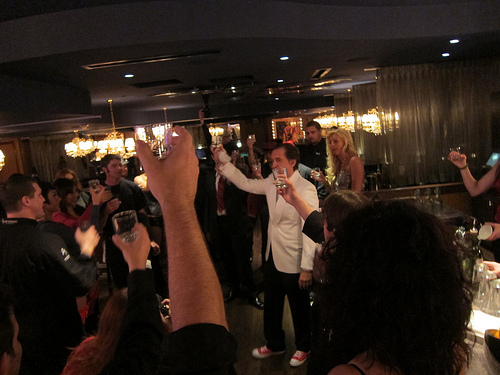 Stay tuned for a full report on the Repeal Day party presented by Bar Magic’s Tobin Ellis on The Minty soon. 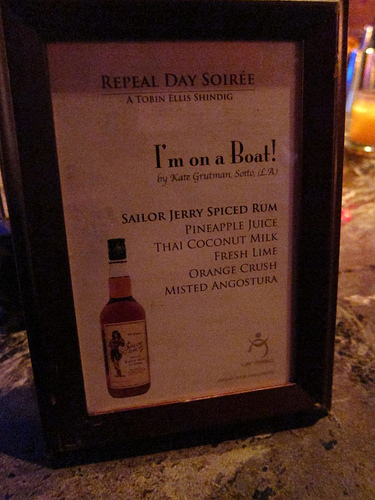 This entry was posted in bar stories, bars, bartenders, cocktails, events, history, hot bartenders, spirits and tagged bar magic, bar stories, cathouse, cocktail history, cocktailian, cocktails, I'm on a boat, kate grutman, las vegas, luxor, repeal day, repeal day party, rum, sailor jerry's rum, social mixology, sotto, spiced rum, tobin ellis, vegas. Bookmark the permalink.